Mechanicsburg’s Elly Schipfer (right) spikes a ball through the Riverside defense on Monday at Mechanicsburg. 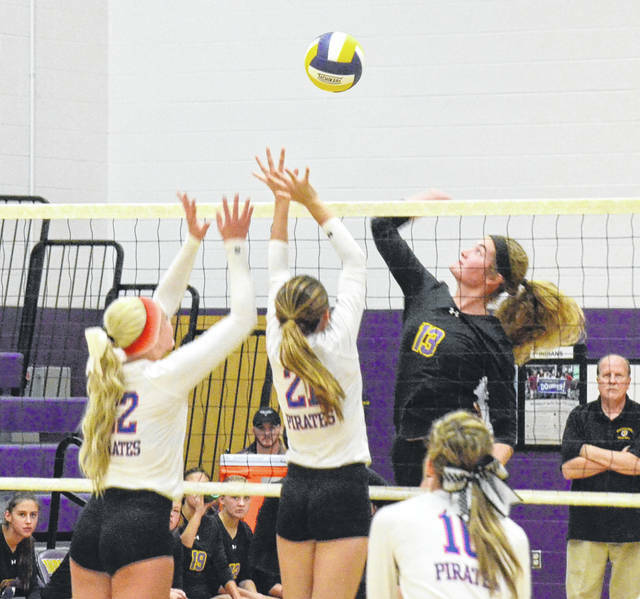 MECHANICSBURG — Mechanicsburg and Riverside met for a thrilling five-set volleyball clash on Monday, with the home team prevailing, 19-25, 25-12, 20-25, 25-19, 15-9. The first set was a competitive, back-and-forth affair, with Riverside eking out a 25-19 win with some nice plays down the stretch. “I think they need to be pushed. They really respond to that. In coaching, you tell them to do something, they do it. They respond. It doesn’t surprise me that the opponent can dictate to them like that as well. They’re a great group of kids,” Mechanicsburg Coach Tom Lee said. Mechanicsburg came back and dominated the second set, winning a couple of long volleys. Emma Dunham smashed home a resounding strike to score the winning point and even the match. The third set was closely contested late, but the Indians surrendered a 9-0 lead and watched the Pirates battle to the 25-20 win. The action was punctuated briefly in the middle of the set when Riverside’s Jenna Woods went flying into the bleachers to chase down a live ball, tripping and running head-first into the steps. She stayed down for a few minutes before being helped off the court under her own power. Meanwhile, it seemed like the more the pressure was on, the more fun the Indians had. The home girls responded once more in the fourth, battling back from a 15-12 hole to a 20-17 lead before Riverside called timeout. The Indians had played nearly perfect volleyball during that stretch. They finished it off coming out of the timeout. In the tiebreak set, Mechanicsburg broke an 8-8 tie with an emphatic point and the girls celebrated with a primal scream, which seemingly ignited the team and propelled it to an 11-8 lead before a Riverside timeout brought pause to things. Coming out of the timeout, the Indians were just as dominant and put the match away against a young and rattled Pirates’ squad, each point building on the last until a crescendo of applause greeted the winning point. Mechanicsburg (1-0) will face Northeastern tonight at home. In 8th grade action, West Liberty-Salem defeated Triad, 25-8, 25-5. Top servers for WL-S were Caitlyn King with 13 aces and Makenna Smith. In the 7th grade match, WL-S beat Triad, 25-14, 25-8.
https://www.urbanacitizen.com/wp-content/uploads/sites/36/2018/08/web1_EllySchipfer082018_ne201882020435900.jpgMechanicsburg’s Elly Schipfer (right) spikes a ball through the Riverside defense on Monday at Mechanicsburg.